The second screen - is the family on assistance? If the family is receiving benefits, they are fast-tracked to the end. 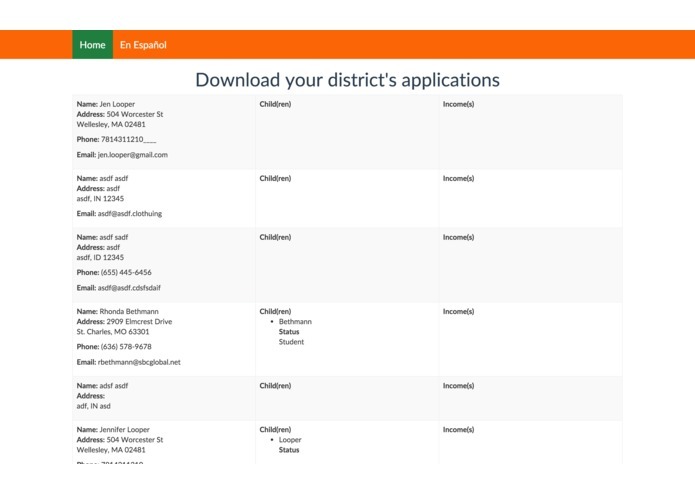 The admin backend shows one district's information, with downloadable data available. 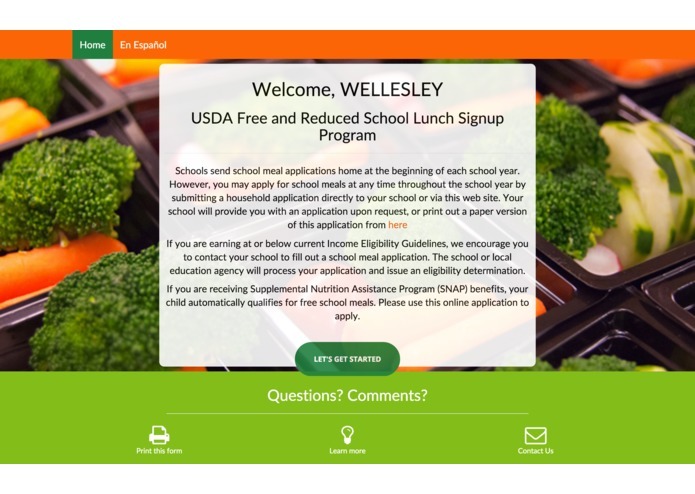 The goal of this hackathon is to create a highly usable, responsive, adaptive form that will reduce errors and aid families in applying online for free and reduced-price school lunches. 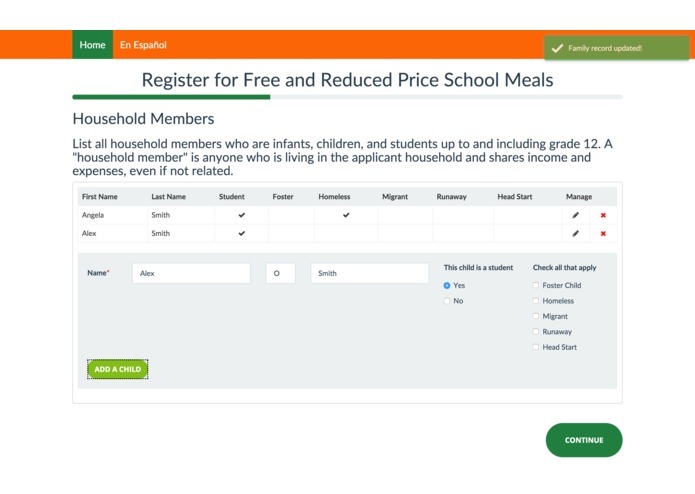 As a parent with children currently in the public school system, it is my hope that, by building this hi-res form prototype, I can support the government's efforts to aid this group of school children and their families. 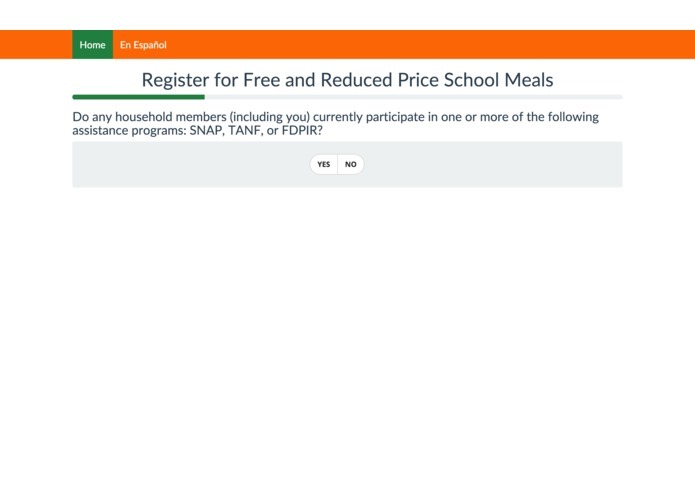 I chose the color scheme specifically to inspire families to pick healthy choices - even if they're doing something as mundane as filling out a form. 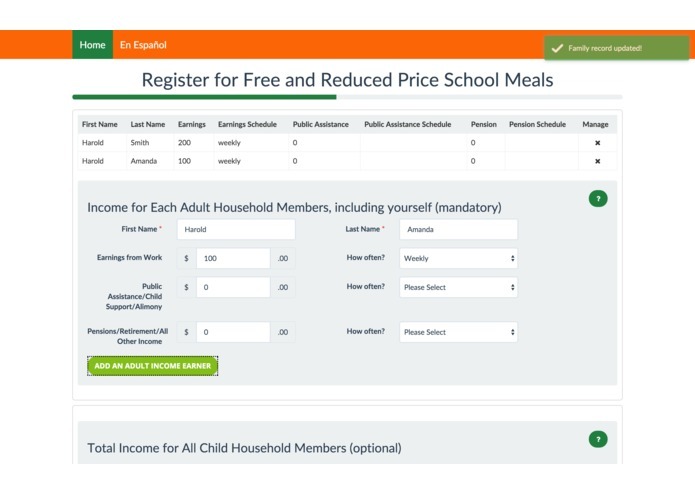 This form is accessible, responsive, and adaptive. 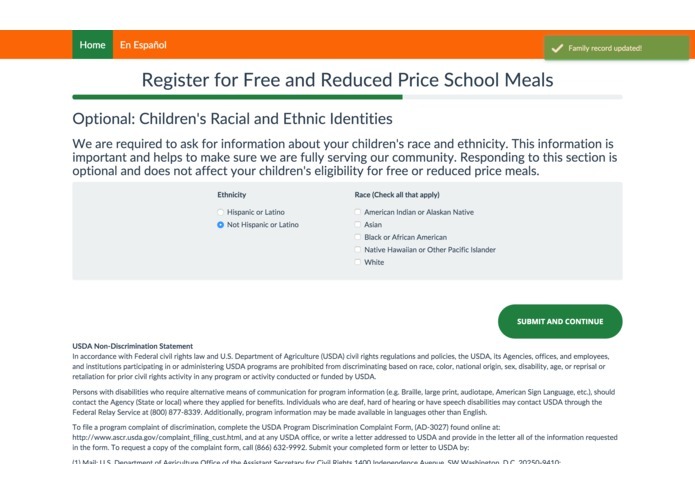 Since it is a government form, it includes an accessibility plugin designed for Bootstrap and built by Paypal Engineering for use on screen readers and other handicap-accessible web tools. 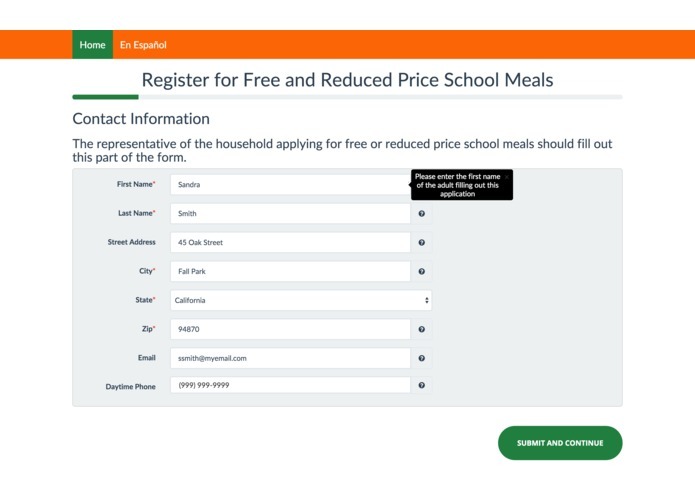 The form is designed to be responsive using Twitter Bootstrap and Kendo UI css for styling so that it will display well on small screens (smart phones) - many of my testers tested the form on a mobile device and reported back that it worked well. 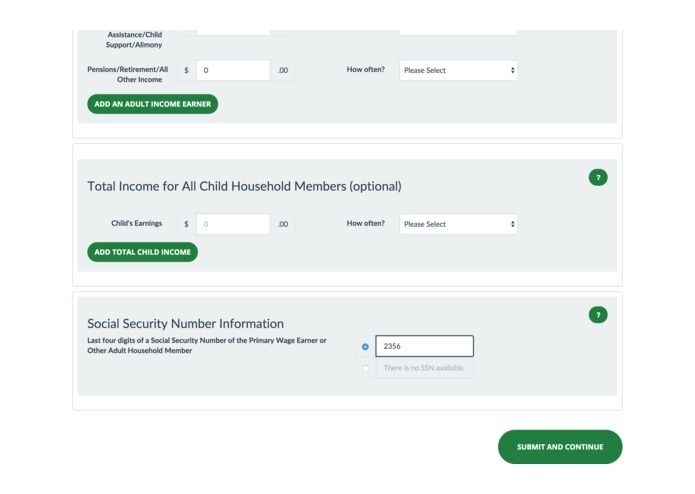 Most importantly, the form is meant to be adaptive - based on user input, different parts of the form are shown. 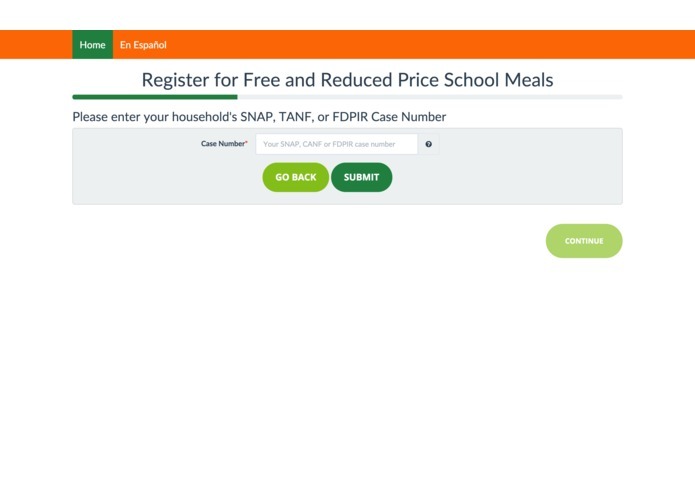 The workflow supports four different 'personae' - a family who receives SNAP or TANF benefits, a family whose children do not receive these benefits but ALL OF whose children are all categorized as having 'status' as foster, runaway, homeless, etc, a family who does not receive benefits but SOME OF whose children are categorized as having 'status' as the above family, and a family who have NO children in that category. 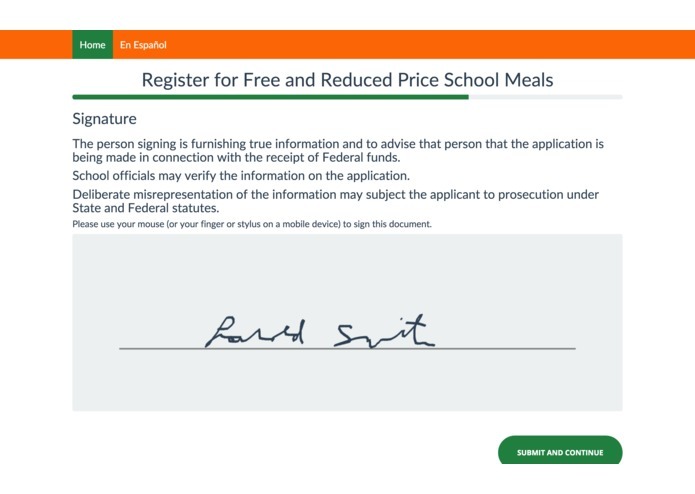 Depending on the category of the family, the form shows or hides sections, or displays or hides validation. The tools used in this app are all open-source and the app itself is licensed under the MIT license; see the ReadMe on Github for more information. 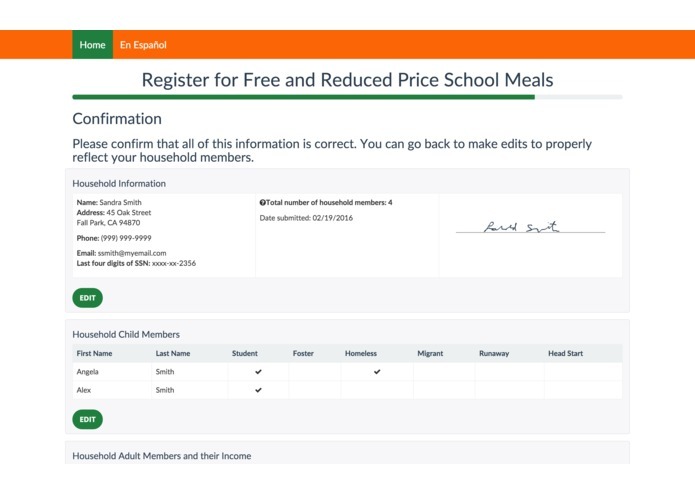 The form is also is designed to triage data by district. 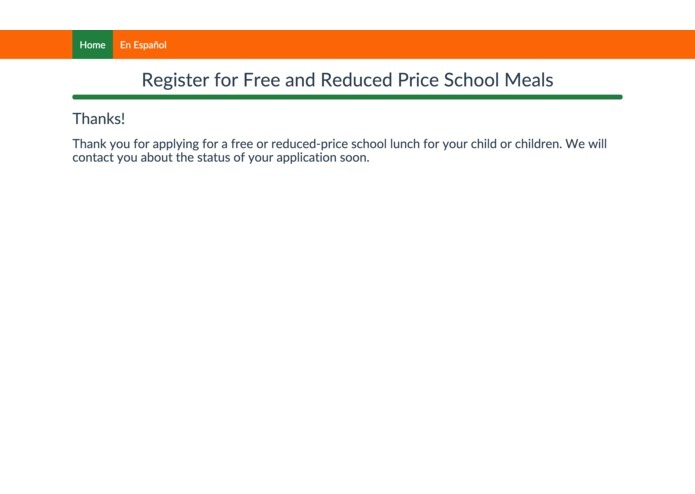 By changing the URL parameter for 'district' on the homepage and the admin backend, it allows districts to isolate the data flowing into the form; the Wellesley School District, for example, is district number 0317 according to the CKAN API, and a school district could ask all their potential meal recipient families to fill out the form using a url such as http://eatlunch-usda.herokuapp.com/#/?district=0317 to associate families with a district id in the database. Typography shows a hierarchy of importance as the form progresses. Each page has a gradation of type. I work full-time and have a family, and I'm happy that I could complete this project! It was a big technical challenge but it helped validate the usefulness of the web stack that I developed (M.o.N.K.E.y, previously M.I.K.E, when we could swap out Node.js for io.js). For some reason I am particularly happy with the jSignature plugin that was really fun to play with even for my testers. It was cool to see the data collected by that plugin saved right into the database. I have never built a full fledged app using this particular tech stack, so this hackathon gave me a lot of good code samples I can use going forward. I re-learned how important user feedback is. I incorporated many of their comments in the final design. Software is never finished, so many iterations could be made to improve various areas. In particular, the admin area could be locked down with a password. It would be interesting as well to further customize the app according to the district since I built in the ability to set the district Id.